Lithium is the  furst memeber of alkali metals. Atomic number of lithium is 3 while its atomic weight  is 6.94 u.
Electyronc configuration of lithium is 1s2 2s1. Alkali metals are strong reducing agents and hence can not be extracted by reduction of their oxides or chlorides. Alkali metals being highly electropositive can not be displaced from the aqueous solutions of their salts by other metals. Alkali metals can not be isolated by electrolysis of the aqueous solution of their salts since hydrogen is liberated at the cathode instead of the alkali metal because the discharge potentials of alkali metals are much higher than that of the hydrogen. However, by using mercury as cathode, the alkali metals can be deposited at the cathode but the alkali metals so deposited readily combines with mercury to form an amalgam from which its recovery is very difficult. Therefore in view of above difficulties, only successful method is the electrolysis of their molten (fused) salts usually chlorides. The finely powdered silicate ore is first heated to about 1373 K to make it more friable and then with  H2SO4 at 523 K. The Li2SO4H2O thus formed is cooled, leached with water and then filtered to remove silica (SiO2). The filtrate thus obtained is treated with a calculated amount of Na2CO3  to precipitate aluminium and iron as carbonates which are filtered off. Excess of  Na2CO3  is then added to the filtrate to precipitate Li2CO3. This is filtered and dissolved in HCl to obtain LiCl which is purified by extraction with alcohol. The powdered silicate mineral is fused with CaCO3 and the fused mass is extracted with HCl and filtered. The filterate contains chlorides Li, Al, Ca, Na and K whereas silicon is removed as insoluble residue. 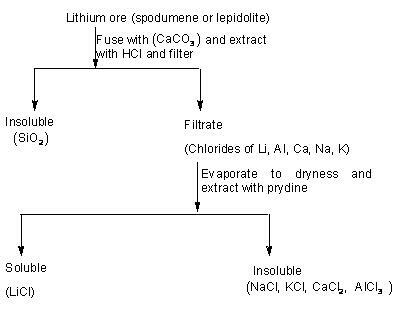 The filterate is evaporated to dryness and the residue is extracted with pyridine in which only LiCl dissolves. Pyridine is distilled off while LiCl is left behind. The method discussed above may be summed up in the following flow-sheet. 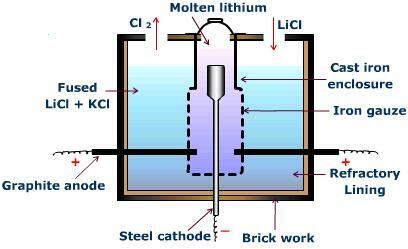 A mixture of dry lithium chloride (55%) and potassium chloride (45%) is fused and electrolysed in an electrolytic cell shown in the figure. Potassium chloride is added to increase the conductivity of lithium chloride and to lower the fusion temperature. The cell is operated at a temperature of about 723 K and voltage of 8-9 volts is applied. Chlorine gas, a valuable by product liberated at the anode leaves the cell through the exit while molten lithium rises to the surface of the fused electrolytes and collects in the cast iron enclosure surrounding the cathode. The metal thus obtained is 99% pure and is preserved by keeping it wrapped in paraffin wax. It may be noted here that lithium being the lightest metal known (density = 0.534 g ) can not be stored in kerosene oil since it floats on the surface. Lithium is a silvery white metal. It is the hardest alkali metal but still is soft enough to be cut with a knife. Atomic and ionic radii of lithium are the lowest amongst alkali metals. Li has highest melting point among the alkali metals. Therefore, cesium atoms should lose electrons most easily, and lithium atom should do it with difficulty. So, lithium should act as q weaker reducing agent than cesium. But, experimentally, lithium is found to be the strongest reducing  agent in the group. Li acts as the strongest reducing agent dye to it low ionization energy and very large hydration energy of enthalpy. Lithium is highly reactive element. 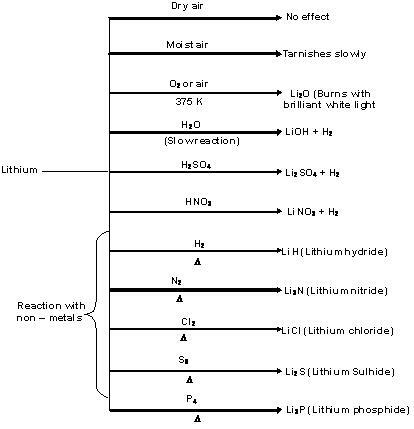 However, among alkali metals lithium is the least reactive. Lithium is the only alkali metal which combines directly with nitrogen to form lithium nitride. Lithium nitride is ionic and is ruby red. On heating it decomposes to its constituent element. It also reacts with water evolving ammonia. Like other alkali metals, lithium dissolves is liquid ammonia to form a deep blue solution due to formation of ammoniated electrons. Lithium lead alloy (0.05% Li) which is used for making toughened bearings and sheets for cables. Lithium – Aluminium alloy has great tensile strength and elasticity like that of mild steel. It is used for air craft construction. Lithium – magnesium alloy (with 14% Li) is extremely tough and corrosion resistant which is used for armour plate and aerospace components. Lithium is used for refining of metal like copper and nickel as it combines readily with oxygen and nitrogen and thus removes the last traces of oxygen and nitrogen. Lithium chloride is used in air conditioning plants to regulate the humidity. Lithium carbonate is used in making special variety of glass which is very strong and is weather proof. The extremely small size of lithium atom and its ion. Greater polarizing power of lithium ion ( Li+), due to its small size which result in the covalent character in its compounds. 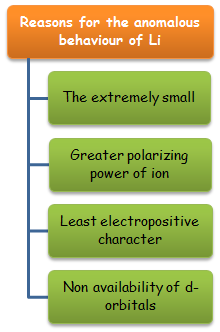 Least electropositive character and highest ionization energy as compared to other alkali metals. Non availability of vacant d-orbitals in the valence shell. The reason for resemblance of properties of lithium with magnesium is that these two elements have almost same polarizing power. The melting point and boiling point of lithium are comparatively high. Lithium is much harder than the other alkali metals. Magnesium is also hard metal. Lithium reacts with oxygen least readily to form normal oxide whereas other alkali metals form peroxides and superoxides. LiOH like Mg (OH)2  is weak base. Hydroxides of other alkali metals are strong bases. Due to their appreciable covalent nature, the halides and alkyls of lithum and magnesium are soluble in organic solvents. Unlike elements of group 1 but like magnesium. Lithium forms nitride with nitrogen. LiCl is deliquescent and crystallizes as a hydrate, LiCI2H2O. Other alkali metals do not form hydrates. also forms hydrate, MgCI2.8H2O . 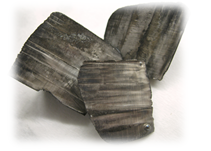 Unlike other alkali metals lithium reacts directly with carbon to form an ionic carbide. Magnesium also forms a similar carbide. The carbonates, hydroxides and nitrates of lithium as well as magnesium decompose on heating. The corresponding salts of other alkali metals are stable towards heat. Lithium nitrate, on heating, decomposes to give lithium oxide, Li2O  whereas other alkali metals nitrate decomposes to give the corresponding nitrite. Li2CO3, LiOH, LiF and Li3PO4  are the only alkali metal salts which are insoluble in water. The corresponding magnesium compounds are also insoluble in water. Hydrogen carbonates of both lithium and magnesium can not be isolated in solid state. Hydrogen carbonates of other alkali metals can be isolated in solid state. Name the chief factor responsible for the anomalous behaviour of lithium. Which of the following alternatives represents the compound A correctly? Question 2: Which of the following salts of Li is/are soluble in water? Question 3: Due to their appreciable covalent nature, the halides and alkyls of lithum and magnesium are soluble in. 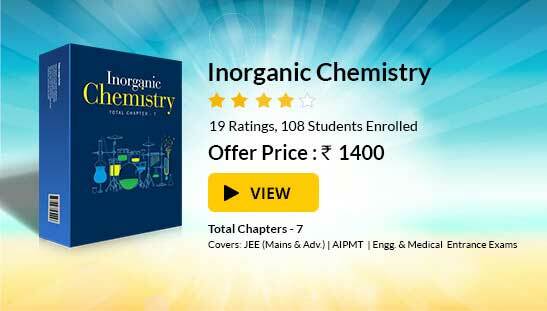 Knowing the about the important books for preparing IIT JEE would help you a lot. To read more, Buy study materials of S- Block elements comprising study notes, revision notes, video lectures, previous year solved questions etc. Also browse for more study materials on Chemistry here.